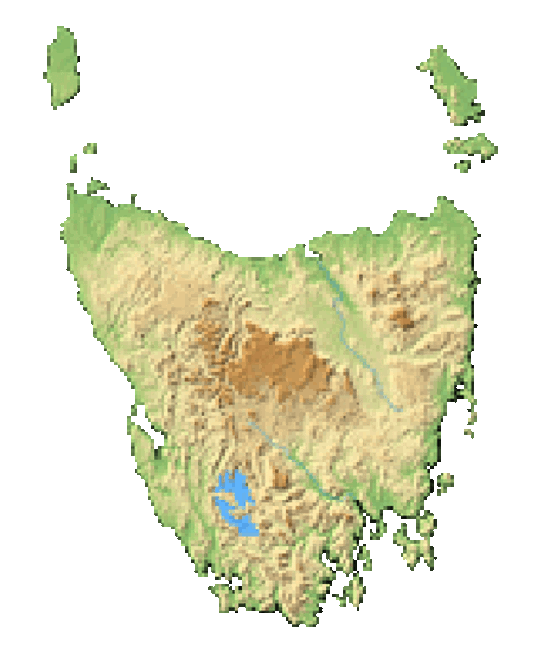 Tasmania is uniquely situated for the exploration of Antarctica. With deep waters in the Derwent River estuary, Hobart is the perfect harbour for icebreakers and other large ships headed south. With European colonization starting in Tasmania in the early 1800s, Antarctic explorations have been taking place for over a century. In fact, Hobart was the staging ground for a race to the South Pole, which was eventually won by Norwegian Roald Amundsen in 1912. Just think about that -- the south pole has only been accessible for just a over a century. This brand-new exploration ground is still being investigated by multiple countries making their bases in Tasmania. And with their research comes plenty of Antarctic exhibitions for you to enjoy. James Cook, on a worldly expedition, brushed close to Antarctica in 1773, noting, "No man will ever venture farther south than I have done." He sent word back to Europe of thriving seal and whale life in the southern reaches of the world's oceans which beckoned sealers and whalers in the late 1700s. Looking to strike it rich, ships from all over the world descended on Hobart's harbour to stock up before heading south. Sealers and whalers, finding the Macario Islands quite easily, began to hunt indiscriminately in the Great Southern Ocean. But it wasn't until 1831 that Capt. Biscoe circumnavigated the Antarctic continent. He and his crew barely made it as his ships slinked back to Hobart Harbour with everyone suffering from scurvy. James Weddell, Captain Biscoe's shipmate, would eventually discover the Weddell Sea in 1833 during a voyage to the 74th parallel -- the most southerly expedition to date. By now, the race to the South Pole was in full effect. France, Great Britain and others began to send ships down to Antarctica beginning in 1839. The first Tasmanian to venture down to the southernmost continent joined a Norwegian over-winter trip in the mid-1800s. But the south pole continued to elude adventurers from all over the world until 1912. That's when the Fram mysteriously arrived in the deep waters of Hobart Harbour. The crew began procuring provisions while it's Captain, Roal Amundsen, remained on the boat. Where the crew had been remained a mystery until Amundsen left the ship, walked the streets of Hobart and sent a dispatch to the King of Norway. The race had been won. Around this time, Douglas Mawson began his Australasian Antarctic Expedition. Using Hobart as a home base, Mawson began to launch exploratory and investigative trips to Antarctica. During his second trip, he was horrified by the overhunting of seals, penguins and whales on the Macquarie Islands. He brought his appalling discovery back to Tasmania where the government quickly named the islands a protected sanctuary in 1933. Due to Mawson's passion, Australia created the Australian National Antarctic Research Expeditions (ANARE). The goal was to establish a foothold on the Antarctic continent like many other countries and a station was established in 1954. It was ceremoniously named Mawson. The original headquarters of ANARE were based in Melbourne, but later moved to Kingston in 1981. With its proximity to Antarctica and with the backing of the Australian government, Antarctic institutions, exhibits and enterprises have exploded on Tasmania. Australia now runs four permanent stations on Antarctica and runs a full-time resupply and research vessel known as Aurora Australis. Australia is now responsible for maintaining over 42% of Antarctica. This is done from the Australian Antarctic Division headquarters in Kingston just south of Hobart. The Antarctic division runs a visitor centre which is open to the public daily. Inside, you'll learn how Australia was one of the 12 nations to agree upon the Antarctic Treaty back in 1961. You'll also find a wealth of photographs, retired scientific vehicles, authentic clothing, cold-weather equipment, original photographs and informational displays. You can also enjoy the café. It's nice to warm up with a coffee after exploring the frozen continent by proxy. Right on the banks of the River Derwent in Hobart, you'll find the Royal Tasmanian Botanic Gardens. This beautiful garden has one distinct feature that sets it apart from the rest -- the Antarctic exhibit. You'll have to enter a frozen building full of cool mists that allow Antarctic flora to thrive. Each of the plants that you find inside this exhibit live on the Maquarie Islands, a frozen southerly territory of Australia. You'll be shocked at just how much plant life can survive and thrive in such inhospitable conditions. With plenty of green and low-lying plants, the Antarctic exhibit is an ethereal way to connect with the frozen continent. 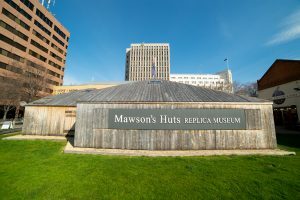 Open daily in Hobart, Mawson's Huts Replica Museum allows you to get up close and personal with replicas of the actual dwellings used by Douglas Mawson's original expeditions to Antarctica in the early 1900s. The huts were actually handmade by the members of the 1911 expedition and they are intact for you to enjoy today. You can experience the rustic conditions that these men faced without having to brave the Antarctic continent your self. And all the money raised by the museum goes to preserving the original huts sitting on Cape Denison in Antarctica. Head down to Hobart waterfront to pay homage to Douglas Mawson and his expeditions. In this public space, you'll find sculptures of Mawson, his men and his dogs exploring the southern continent. And, if you are really lucky, you might catch a glimpse of Australia's icebreaker coming back to harbour while spending time with the sculpture of Mawson and his men. Then head over to the 1849-built Hadley's Orient Hotel. Constructed by convicts, this historic hotel originally housed whaling cruise that decimated the seal, penguin and whale population of the Great Southern Ocean. It was later a stop for Douglas Mawson himself as well as South Pole discoverer Roald Amundsen. The rooms that these men made their homes are now open to the public for a visit -- rooms 201 and 202.